Last night in class the Vase and Shadows painting was another one of those that just went very quickly. I was done with it by 8:30 PM, and still had an hour left of class. 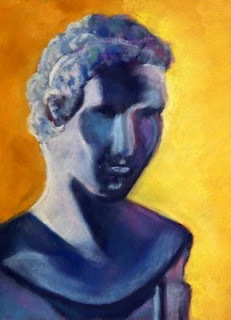 Christina challenged me to try a painting of this small bust which happened to be sitting in the classroom. I was not thrilled with the idea as it just served to remind me of why I don't enjoy drawing people, or have no interest in portraiture.